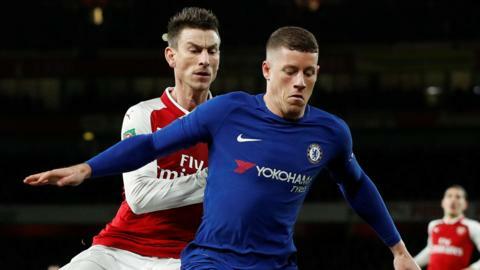 Arsenal 2-1 Chelsea (2-1 on agg) - Chelsea frustrate us all again with yet another Jekyll and Hyde performance. Another Jekyll and Hyde performance from Chelsea has cost us the chance to go to Wembley and face Manchester City in the Carabao Cup final. It’s beginning to wind me up now, how many more times are we going to sit here and talk about the same thing with Chelsea this season? How many more times are we going to watch us play great for one half but to then disappear in the next? Ahead of the game I stated the obvious, if we were to beat Arsenal, we needed our big players to turn up. In the first half they did as Arsenal struggled to come to terms with our formation that Antonio Conte had started the game with. It was apparent heading to the Emirates that we had a choice of three different tactics we could use to try and beat Arsenal – the 3-4-3 that had served us well last weekend, the 3-5-2 by packing the midfield as we had done on numerous occasions this season so far, or the false nine by playing Pedro and Willian supporting Eden Hazard through the middle. Antonio Conte went with the false nine and within ten minutes we were a goal up through Eden Hazard running onto a through ball from Pedro to slot past the Goalkeeper to make it 0-1 and put us in control. Throughout that first half until Willian picked up a slight hamstring strain, we looked well on top, we looked sharp, dominant and forced Arsenal backwards. Whenever we picked up the ball in the final third you could sense that we could be in on goal but for the right move, the right moment and the right final ball. Ross Barkley came on for Willian and took his position within the false nine and did OK for his first involvement. Of course, he looks lacking in match fitness but that will come with time. He showed so good touches, good involvement and a willingness to get involved in our play which was good to see. By the time Barkley had come on, it was 1-1 with Arsenal scoring from a more than fortunate double deflection from a ball headed goal-wards from a corner that hit Marcos Alonso on the side of the head first to then deflect off of the top of Toni Rudiger’s head while he was looking the other way, to divert the ball away from Willy Caballero in goal to make things even. At half-time it was 1-1 and all to play for in the second half and I honestly thought that we would look to kick on as we had been the more dominant side of the two. I was wrong. Within five minutes of the restart, Arsenal were well on top and as a result (with Antonio Conte bellowing at his side to remain compact) we dropped ten yards deeper than we had been in the first half, giving Arsenal license to dominate possession and come onto us at will again – as we had done in our Premier League game a few weeks ago. Why should we allow this to happen? We had dominated Arsenal in the first half, pushed up and pressed them high causing them problems. Why change our mentality? 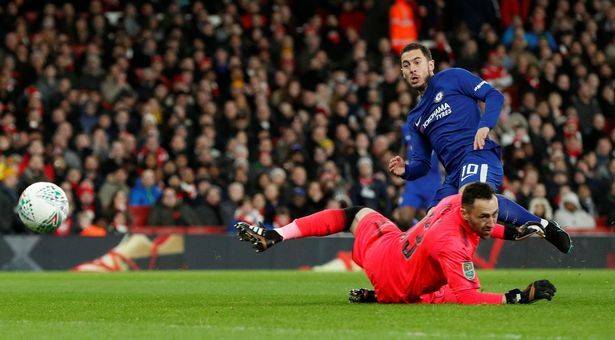 The knock-on effect for Chelsea by dropping ten yards too deep is that Eden Hazard finds himself isolated when the ball is played up to him because he has no-one near him to support him with the ball. As a result, he cannot impose himself on the game as he did in that first half when we played on the front foot and drifts out of the game until it’s too late. Our back five without the ball pushed up and pressed high from goal-kicks or when the Arsenal defence had possession, but as soon as it came through midfield, we found ourselves sitting just outside our 18-yard box! Arsenal score their second (which turned out to be the winner) from yet another lucky deflection that falls to Granit Xhaka six yards out who flicks the ball into the corner of the net having fallen to his feet after a cross into the box comes off the back of Toni Rudiger’s heel. At that point, I knew it was not going to be our day. Pedro came off for Michy Batshuayi who proved to be a much use as a lead arm-bands in a swimming pool tonight. I am a supporter of the Belgian forward on here and believe with regular games he could be the alternative to Alvaro Morata we are looking for but based on this evening I need to re-evaluate my opinion. When we needed him to hold the ball up he couldn’t do it. When we needed him to collect the ball and lay it off he couldn’t do it and offered us absolutely nothing. Edin Dzeko hurry up and sign please. 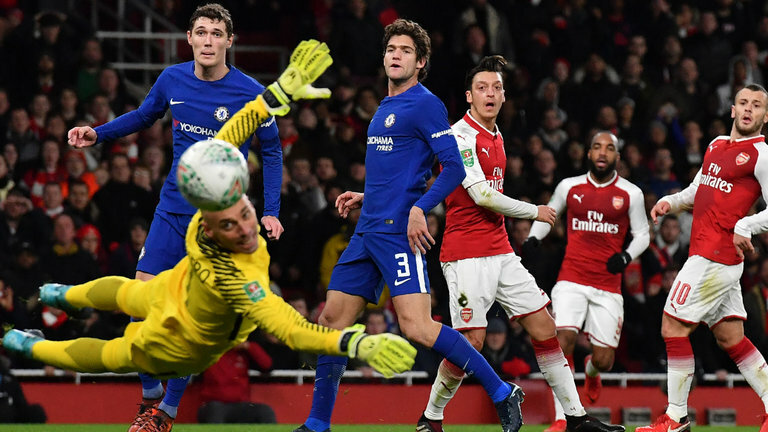 Arsenal could have wrapped things up but for a good save from Willy Caballero late in the game from Alex Iwobi. If anything and on reflection, our goalkeeper was called into action much more than Ospina in the Arsenal goal having also made a good save from Jack Wilshire in the first half also. This season is so frustrating not because we find ourselves where we are in the Premier League and because we have suffered the defeats we have already this season. It’s frustrating because in the big games when it has mattered the most, we turn up for forty-five minutes out of the ninety or for nothing at all which is unacceptable. OK you can accept it happening once or twice in a season but for most of the big-games we have played this year? Something isn’t right because last season, Antonio Conte would have a tactical solution to change the game – this year it simply isn’t there and tonight is yet another example. We’ve let ourselves down again and it’s hard to take.